“We missed the mark, are taking the feedback to heart, and will use this to influence future campaigns,” Heineken said in a statement. 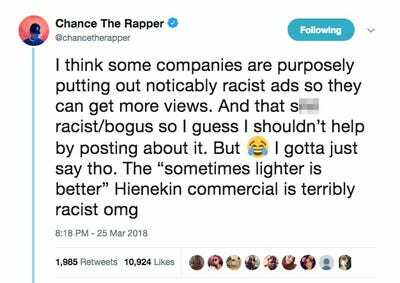 Chance the Rapper and others are slamming Heineken for running a light-beer commercial that some consider racist. 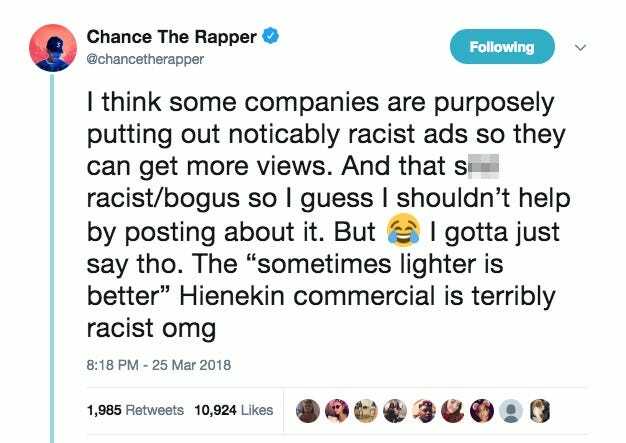 “The ‘sometimes lighter is better’ Hienekin commercial is terribly racist,” Chance the Rapper tweeted on Sunday. In the ad, a bartender spots a light-skinned woman about to drink a glass of wine. He speedily grabs a Heineken Light and slides it in her direction. The bottle is shown passing three people – all men and women with significantly darker skin – before coming to a halt next to the woman’s glass of wine. The words “sometimes lighter is better” appear on the screen. Others on social media echoed that sentiment. “It’s subtle enough to maintain deniability, but noticeable enough to gain publicity,” one person tweeted. “It’s like blatant ‘subtle’ subliminal racism,” another tweeted. 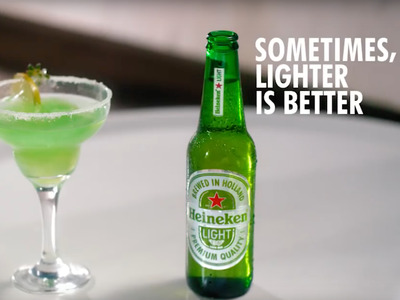 Heineken recently launched a series of ads in its “Sometimes Lighter Is Better” campaign. Twoother ads from the Dutch brewer’s campaign also feature light-skinned people being offered Heineken Light. Those ads, however, do not show the drink sliding past darker-skinned people. “For decades, Heineken has developed diverse marketing that shows there’s more that unites us than divides us,” the company said in a statement to Business Insider.